Description: Q633 westbound at Amsterdam. Minutes later the 633 has ground to a halt due to a hot box near the end of the train. 633 took six hours to get underway again and meanwhile shut down track 2 from CP 175 to 188. Description: Q633 is still stopped on track 2. The rear of Q366 goes east on track 1. Description: Especially if walking on this bridge when CSX Q439 or any of its 143 freight cars was rolling by! Description: Eastbound off the controlled siding at CP Plymouth. Description: At the end of light Q702 heads up to CP 22 and a diverging cear. Description: CSX ES44DC 5232 trails on Q53415 North. 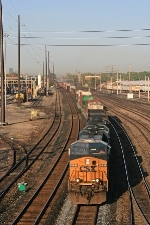 Description: CSX ES44DC 5232 trails on a Southbound Freight. Description: Q493's power sits in the ready field, waiting for the crew's arrival. Description: Bowling Green has received it's largest snowfall in years the day prior with 5-7 inches on the ground in places. Description: Notice I don't get an CSX SD80MAC number #??? ?